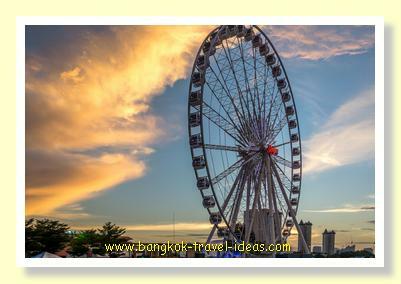 We went past the road that led to Wat Ratcha Singkorn and continued down the road to where we could see the Asiatique Ferris wheel standing against the evening sky. The sun was just beginning to set and the sky was lighting up nicely, most of the threatening clouds had gone. As we got to the entrance there were many more people around now and the car park was already half full. We could have taken the short cut through the car park but I wanted to get some photos of the main entrance. 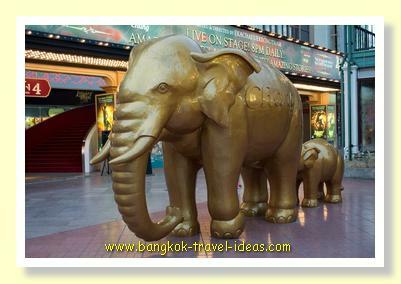 The entrance to Bangkok Asiatique had two large Chang elephants outside. I remembered some fountains being there also but perhaps they had moved them, as I could no longer see them. These fountains used to have coloured lights and were a good place to take photographs. We wandered around the Asiatique nightmarket stalls taking photos and looking at the various restaurant menus for something nice to eat. That is the great thing about a holiday, you can just saunter and relax and make a pleasant use of the time. Eventually we saw somewhere we liked and stopped for dinner at a Thai restaurant. The tables were only small but the place was busy with tourists and they had a good choice of food on offer. 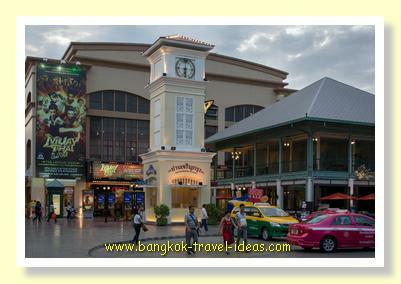 Most of the tourists wandering around Asiatique appeared to be Korean, Chinese and Thai. There were not many westerners at all. The Korean couple on the next table to us were struggling to cope with the knife and fork and had to request chopsticks, not only that but they had ordered more dishes than the size of the table could manage. The staff quickly remedied the situation by making do with one of those little drinks tables and put some dishes on that. By now the crowds had increased somewhat. We joined the meandering throng just looking in the stalls and seeing what was available. Alongside the wide aisles are smaller passages with a hint of mystery. Go hunting for that special gift for the folks back home or if you are keen nip into the Apple shop and grab yourself an iPad or iPhone. 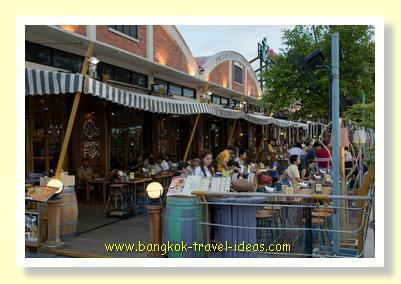 If you have a choice between visiting the Bangkok Asiatique nightmarket or Chatuchak Market then let me highlight the differences. Chatuchak Market is only open on weekends although there are some stalls that open on Fridays. It is also a day market so you need to come early; otherwise it gets really hot under the tin roofs from lunchtime onward. The place is generally packed and probably not suitable if you have children in a stroller or small pram. There are heaps of stalls and stuff to buy and the hustle and bustle gives it a real Asian market feel. 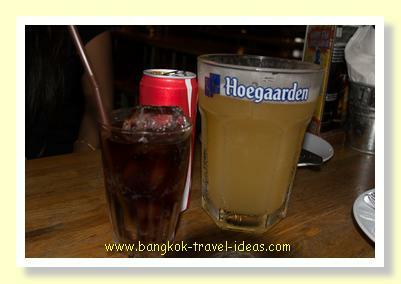 Chatuchak Market has lots of food hall type places but no fancy restaurants. 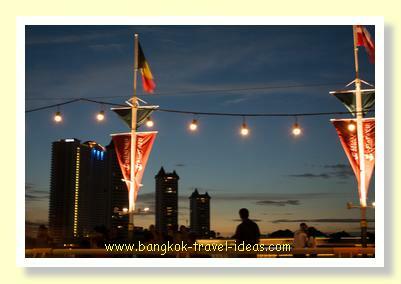 On the other hand Asiatique the Riverfront is a night market. There is plenty of room to push a pram with wide aisles between the buildings, so even with lots of people it does not get too congested. 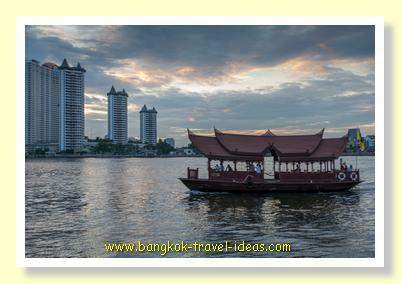 It is also located right on the Chao Phraya River with a nice foreshore to walk on and some find old buildings. The stalls generally sell reasonable quality tourist gifts, but overall, things would cost a little more than in Chatuchak Market. Everyone that visits Bangkok has to visit Chatuchak at least once. 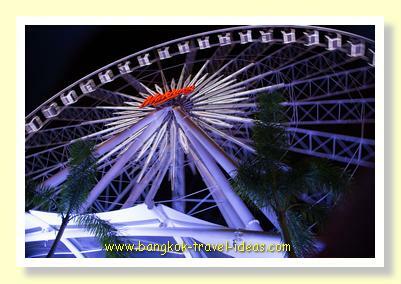 Asiatique also has lots of nice restaurants in which to dine and if you fancy a ride on the big Ferris wheel then you get a great view of Bangkok from up top. After eating we walked down to the waterfront again, although now the place was bustling with people. There are some large restaurants in this location that serve good food; one popular place is called Happy Fish, right in the centre. There was a choice of outside or inside dining and some evenings there is live music inside; outside is quieter. 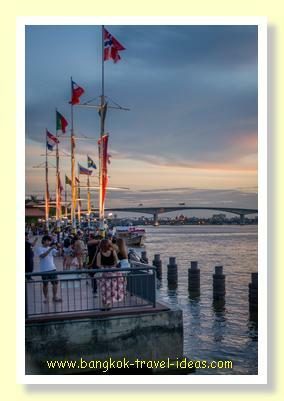 With the river as a backdrop it makes a great place to take the family. The sun had well and truly set for the evening, but the tall buildings along the riverside were lit against the dark sky. The Ferris wheel was now operating with a steady stream of travellers going up to buy tickets. I imagined the view would be quite enthralling at the apex of the ride. We set off walking back to the hotel and on our way out we passed the theatre that hosts daily shows. I am not sure if the performance changes periodically but there was some sort of Ladyboy show on at this time. 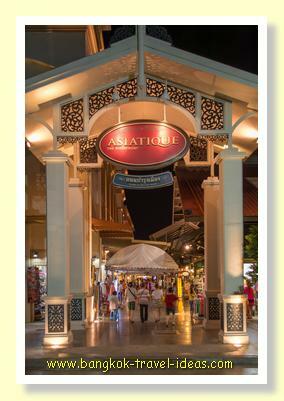 The ticket office is just near the large golden elephants at the front of the Asiatique nightmarket. Taxis leave from the front of Bangkok Asiatique but taking the free shuttle boat back to the Saphan Taksin BTS is probably going to get you back to your hotel cheaply and without fuss.